One of the most popular islands to visit during the summer, Brac offers to its visitors lots of things to do and see. We summed up for you all interesting things to do on Brac Island. Brac is often considered a small continent. The island is self-sustainable, and besides the water that has always been scarce on the island, it pretty much has everything people need to live here. Brac is easily accessible from the mainland. It takes less than an hour by ferry to reach the island (either from Split or Makarska). Although Brac is the largest island in Dalmatia, and the third largest island in the Adriatic, it’s still pretty easy to explore the island in a day or two. On our last visit to the island we took a half-day tour of the island. It was a guided tour, and it included some of the island’s highlights: a visit to Pucisca and the Stonemasonry School, historical village of Skrip with a visit to the Brac Native Museum, and Olive Oil Museum, and the Vidova Gora Mount. We booked the tour through the Bluesun Hotel Elaphusa where we were staying, but there are other agencies in Bol offering this tour. The price is around 270 Kn per person. Beaches on the island of Brac are one of the island's top highlights. Generally, beaches on the south side of the island are the best of all. They are gentler, larger, mostly made of fine pebbles, so fine it feels like sand. The most famous beach on the island is the Zlatni Rat beach. Located at the west end of Bol, this 1 km long beach stretches into the sea in a shape of a cone. Zlatni Rat is a wonderful beach to swim, but it gets really crowded in high season. If you want to skip the crowds, you'll need to go further out of Bol. The best way to do that is by boat. Beaches below the village of Murvica are also popular. They lay just few kilometres west of Bol. Povlja, located in a bay of the same name, has gorgeous beaches too. Beaches on the north side of the island are fewer, and rougher. Coast is rockier. However the only sandy beach on the island, the beach Lovrecina, is on the northern side of the island. I know this might be strange thing to find on a list of things to do on Brac Island. But, Hvar is a neighbouring island easy to reach from Brac, it's simply a must-do if you are staying on Brac Island. There is even a joke between two islands that goes: What's the best on the island of Brac. Answer: The view over the island of Hvar (and vice verse). You can visit Hvar by catamaran or book a boat tour. The catamaran departs daily from Bol to Jelsa. Yes, even in winter months. The ticket costs 25 Kn per person in winter months, and 40 Kn per person in summer months. A catamaran from Milna to Hvar Town departs daily from June through September. A ticket costs 50 Kn per person. When it comes to food, Brac is popular for lamb meat, sheep cheese, olive oil, and mandarins. The food on the island is good. And although the restaurants might seem a bit less creative than in Split, Zagreb or Istria, there are few places to look for while on the island. The restaurant Kopacina in Donji Humac is locals’ favorite place to eat. Simple place with a nice outdoor terrace, Kopacina serves island’s famed lamb in all ways you can imagine (roasted, as peka, baked in a fireplace under the bell-shaped lid, grilled chops, stew, you name it), but also seafood, veggies, risottos and pastas. Seafood is really good here, although the restaurant is located inland. Terrace Cicco, located few kilometers west of Bol, is a special place to eat on the island. Terrace Cicco is a remote place, and the best way to reach it is by boat, the Cicco has one page menu with maybe 10 dishes in total. Besides two meat dishes: prosciutto and lamb, the rest of the menu consists of seafood dishes. Pancakes are the only dessert served. Cicco works until 8.00 pm, and below the restaurant there is a gorgeous beach that is never crowded. Oh, and yes it’s called terrace for a reason: no indoor seating, only a sea facing outdoor terrace. Locals’ favorite restaurant in Bol is Mali Raj, located just few steps from the Zlatni Rat Beach. In Bol, we enjoyed dinner at the Ribarska kucica. This restaurant has the best terrace in Bol. Other popular restaurants on the island of Brac are: Agroturizam Margera in Dol, Bokuncin in Sutivan, and Kala in Povlja. Two quirky specialties that you’ll hardly find anywhere else in Croatia are: vitalac, lamb’s offal wrapped in lamb’s intestines and roasted on a spit; and a dormouse (yeah, you can skip it!). Brac is renowned for its vine. The most common grape varieties planted on the island are Posip (white wine), and Plavac Mali (red wine). A couple of wineries on the island are worth a visit. We’ve visited the Stina Winery on our recent trip to Bol. It’s a state-of-art winery located at Bol’s quayside. Other interesting winemakers to look for on Brac Island are Hrvoje Bakovic from Murvica, and family Senjkovic from Nerezisca. My 5 cents: If you've got a chance to visit the Franciscan Monastry in Bol and taste their homemade dessert wine Prosek, go for it. It's yummy! The oldest settlement on the island, Skrip is simply a must-visit place. It's located inland, not far from Supetar. Skrip is rich in history and a great alternative to a hustle and bustle of coastline towns. Housed in a 16th century Radojkovic Tower, the Museum of Brac reveals the island's history; and museum’s curator – Andrea tells, otherwise dry historical facts, in a super interesting way. Housed in an olive oil mill dating from 1864, the Museum of Olive Oil displays old equipment used to make an olive oil and presents traditional process of olive oil making. Other interesting sites in and around Skrip include the Church of St. Helen from 18th century, the Cerinic Castle from 16th century, and a Roman quarry Rosohe. The Museum of Olive Oil opened in Skrip in May 2014. Kruno Cukrov restored an old family mill that first opened back in 1864. A small family-run museum displays traditional equipment and tools used to process olives into olive oil. There is also a small shop where the family sells their homemade products like olive oil, vinegar, jams, etc. At the top floor there is a small tasting room. Entrance is free for individual visits, but you can support this family's efforts by purchasing some of their products. The island of Brac is famed for the white marble found on the island. The only Stonemasonry School in Croatia, and one of few in all world, where students still learn a manual stone works, is found in Pucisca on the island of Brac. The school opens for visitors who want to see and learn about this ancient work of art. You can even see students at work. Brac is a great place for hiking enthusiasts. Covered in olive groves and pine forests, the island offers lots of hiking opportunities: from gentle strolls to challenging hikes. There are few companies offering exclusively walking holidays, like Britain based Footsteps in Croatia, and Croatia based Dalmatia Trekking. The most popular hiking trails are from Bol to Vidova Gora summit, Murvica to Dragon's Cave, Nerezisca to Blaca Hermitage, Farska to Blaca Hermitage, and from Sumartin to Planik. Brac isn't famous rock climbing destination in Croatia. But it has few crags with short routes, the most famed being Lozisca, located on the northwest side of the island, halfway between Sutivan and Milna. Lozisca is the only area on the island of Brac with the established routes. All pitches are short and single but with a good variety of challenges, slab and overhanging walls. All crags are bolted and well-maintained. The site is maintained by Aldura Sport from Sutivan. Aldura is a travel agency specialized in adventure tours on the island of Brac. Aldura Sport organizes group tours to Lozisca for beginner climbers. The tour takes 3 hours, and the price is 290 Kn per person. Check Aldura Sport’s website for more info. Vidova Gora is the highest summit, not only of the island of Brac, but of all Adriatic islands. The summit is 778 m high. If you aren't into hiking, or visit Brac during the summer, when temperatures are too high for hiking, don't worry. Vidova Gora is easily reachable by car. From the summit you'll enjoy a wonderful view over popular Zlatni Rat beach, the island of Hvar and its rugges coastline, and the blue Adriatic sea. On a clear day you can see as far as Italy. There is a bar/ restaurant at the top, although whenever we visited there, the bar was closed. Little populated, south shores of the island of Brac were designed military zones in ex-Yugoslavia. Former submarine pens that can be found in Maslinova, Kruscica and Smrka bays are seen today as a shelter for local fishermen, a tourist attraction and swimming spots. The best way to explore them is by boat. The southern shores of Brac abound in hermitage sites. At the latitude of 300 m, between Bol and Blaca, from East to West, there used to be six hermitage sites: Stipancic, Zmajeva Spilja, Silvio, Draceva luka, Dutic and Blaca. This area wasn't inhabited, and as such was a perfect solitary spot for priests, where they could devote their life to prayer, meditation, penance and fasting. All hermitage sites were founded in 15th and 16th century, when Catholics from the mainland found a refuge on the island after invasion of Ottoman Empire. Two most popular hermitage sites, visited by many locals and tourists every year, are Zmajeva Spilja (Dragon's Cave) and Pustinja Blaca (Blaca Hermitage). Zmajeva Spilja (Dragon's Cave) is located above the village of Murvica, at 300 m high cliff. This hermitage, although less popular than the Hermitage Blaca, is well-worth a visit. Dragon's Cave is the only hermitage here on Brac located entirely within a cave. It's famed for reliefs od dragon carved in the stones. Pustinja Blaca (Hermitage Blaca) is the most popular hermitage on Bol visited by many tourists. The last Saturday in August, in an honor of the Assumption of the Blessed Virgin Mary, locals traditionally organize a pilgrimage to the Blaca Hermitage. Raised on a steep hill, this monumental complex, carved into the cliffs, was a home of the Croatian Glagolitic order. Today Pustinja Blaca is the museum. Its library features over 11.000 books, it features the third biggest telescope in all Croatia. A must-see! Although neighbouring Hvar, Vis and Solta, represent more popular diving destinations, and many diving centers on the island of Brac offers boat trips particularly to Hvar, Brac does have couple of interesting diving spots along its coast. Lucice Cave, located on the southeast side of the island, is an underwater dessert consisting of a spacious chamber at 15 m, and two underwater tunnels dropping down at 30 m and 44 m.
Drasine Cave at only 5 to 8 m depths reveals remains of a Roman mosaic. Golubinja Spilja abounds in underwater flora, fauna, rocks and reefs. Who doesn't like sea kayaking?! And what a better way to explore a coastline than paddling your way around?! There are many companies renting single and double kayaks, but also offering organized kayak tours around the island. One such company is Aldura Sport based in Sutivan, on the north shores of Brac. Aldura offers a 3.5 hour kayaking tour from Sutivan along northwest coast of Brac to the Cape Gomilica with swimming and snorkeling breaks along the way. The tour cost 270 Kn per person. A kayak or SUP rental costs 50 Kn per hour or 300 Kn per day. Whether you're an experienced windsurfer or someone who'd just like to try it out, windsurfing in Bol won't disappoint you. The Zlatni Rat Beach is actually one of the most popar spots in Croatia for windsurfers. There are few windsurfing centers in the vicinity of the Zlatni Rat beach offering windsurfing courses and equipment rental. Big Blue Sport, located at the beach below the hotel Borak, is a favorite windsurfing center in Bol. Staff is super friendly, prices are affordable, and they often run specials with good discounts. For a beginner group course expect to pay 25€ per hour , while an advanced individual course will set you back 45€ per hou. School board sail rental costs 18€ per hour, or 40€ for 4 hours. More info on Big Blue Sport's website. Brac Island is a perfect destination for mountain biking. Since Vidova gora is the highest summit on the island, naturally many cycling routes lead here, to the highest peak of the island, where cyclists can enjoy gorgeous views over the sea, the island of Hvar, and the Zlatni Rat beach. A cycling route from Bol to Vidova gora, is a challenging, grade 4 ascend taking you from the sea level to the altitude of almost 800 m, but gaining along the way a total elevation of 1100 m. Similary, there is a pretty challenging, and 20 km longer, cycling route from Supetar to Vidova gora. Likewise, from Sumartin, a ferry port on the southeast shores of Bol, you can cycle to Vidova Gora. The easiest cycling route is a short, 16 km long, relatively flat route from Sumartin through Selca and Novo Selo back to Sumartin. You can also look into booking a cruise and cycle holidays where you visit central Dalmatian islands (Brac, Hvar, Vis) with a boat, and then cycle from one port town to other. This is a great way to trully experience Dalmatian islands. The island of Brac abounds in Early-Christian and Pre-Romanesque churches. Even if you don't care about sacral architecture and historical remains, it's impossible not to notice these small churches all over the island. They are simply too many to go unnoticed. The most interesting are The Church of Holy Spirit in Skrip, the Church of St. Theodore and John in Bol, the Church of St. Michael near Dol, the Church of St. Elijah near Donji Humac, churches of Stomorica and St. Martin near Lozisca. The interesting fact is that all those churches are still in a very good state. The white marble from Bračc is world-renowned. 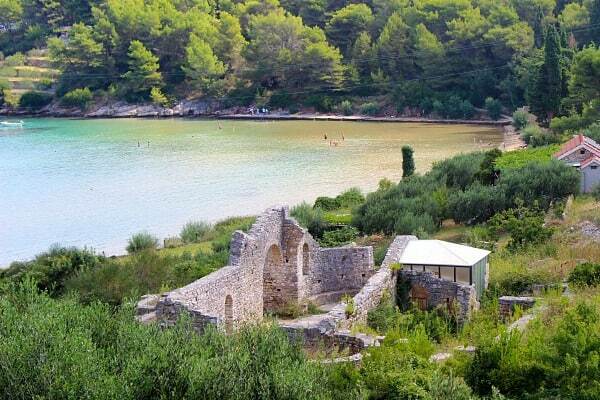 As we've already mentioned, the only Stonemasonry School in Croatia can be found in Pucisca on the island of Brac. There are many quarries on the island, where different type of stone is excavated. The oldest quarry on the island – Rasohe is located in the vicinity of Skrip, and it dates back from Roman times. At the entrance of a quarry, carved in a cliff, is an ancient relief of Hercules, most likely dating back to third century. The Hercules is naked with only a lion skin over his shoulder. His fists are disproportionally large compared to his body, as a way to emphasize his strength. This relief is one of the most important examples of ancient sculpture on the island of Brac. The walking trail from Splitska to Rasohe is clear, marked and maintained. Similar to windsurfing, kite-boarding is popular sport at the Zlatni Rat Beach due to a preferable west wind called Maestral with constant speeds of 15 to 25 knots. Popular kiteboarding centers are located along the Bol's boardwalk near the Zlatni Rat beach. Zuti macak kite-boarding center offers 1 to 5 day kite-boarding courses for beginners. The price ranges from 840 Kn for 1day course, to 3.120 Kn for a 5day course. More info at Zuti Macak website. Few companies in Bol and Supetar offer fishing excursions aboard specialized fishing boats. Big game fishing tours depart in the morning from Bol ir Supetar toward islands of Hvar and Vis. It's a full day excursion tgat includes trolling, a lunch break and drifting. You can expect to fish bluefin tuna, swordfish, and small sharks. If you go mid game fishing, you can catch dentex fish, smaller tuna fish, bonito, sea bass, and alike. While on board a fishing boat you can also fish for smaller fish using baits and rods. Expect to pay 175€ per person. The prices drop for two and more people. Brač is a great island to spend your vacation in Croatia, wether for couple of days, or longer. You'll have loads of things to do on Brac island. If you would like to plan your stay in Brac further, we've compiled the most important chapters for your travel planing in our quick Brac Island travel guide below. Choosing where to stay on the island, when you have never been there, isn't easy. Popular resort towns are Bol, where most visitors to the island stay due to famed Zlatni Rat beach, and largest choice of hotels in Brač; Supetar, a ferry port, and island's administrative center, Supetar has a good choice of private apartments, and smaller hotels and inns; neighbouring Sutivan, has only one hotel – recently opened Lemongarden, but it's well worth checking out; Milna, located in a lovely bay on the northwest side of the island, is more popular among sailing aficionados and locals than tourists, and the best bet for accommodation in Mirna is to rent a private apartment. Hotel Osam has a curious story behind its name. Due to Croatian bureaucracy, it took the owner 8 years to open the hotel (from idea, through paperwork, to actually building it an opening it). In the honor of that absurdity, he simply named it Osam, which is Croatian word for eight. The hotel is well-appointed, centrally located, and very close to the sea, with awesome roof-top terrace, outdoor swimming pool, onsite restaurant, and lovely sea views from majority of its 24 rooms. This hotel is adults-only. Check availability and prices. Hotel Lemongarden, Sutivan: The newest addition to Brac hotel scene, adults-only hotel Lemongarden is housed within 300-year old building, and it disposes of 24 suites, and 12 rooms. Large, beautifully landscaped garden dominate the property, with outdoor swimming pool at its centerpiece. While exposed stone walls are common throughout the interiors, furniture, and fittings are modern, and minimalist. Onsite bar and restaurant are at the waterfront, and hotel also has a beach for hotel guests. Check availability and prices. Bluesun Hotel Elaphusa, Bol: We've stayed in Bluesun Hotel Elaphusa few times in the last couple of years. This hotel is large, and that's perhaps its only down side. For the rest, the hotel is as close to Zlatni Rat beach as it gets, some rooms even have views over this wonderful beach. The buffet food is varied, and good quality. Make sure you book Superior sea side room with balcony for the best comfort, and views. Standard rooms are a bit smallish. Staff is super friendly, and make the hotel feels more intimate that you expect from 300-room hotel. Check availability and prices. Belado Residence Bol: These modern, spacious apartments with large terraces and wonderful views come fully-furnished with high-end appliances and fixtures. Spacious apartments with high end furnishing. Owners are friendly, and helpful. Check availability here. Villa Camellia, Supetar: Within walking distance from Supetar centre, ferry port, and a sea, Villa Camellia is a beautiful stone house with enclosed courtyard, and outdoor swimming pool. Apartments are spacious, nicely-appointed, and amenities include Weber BBQ grill, 46-inch smart TV, dishwasher, deck chairs, and alike. Find more info here. Hostel D&D, Supetar: This nice family-run hostel in Supetar offers double, twin, and dorm rooms with shared bathrooms. Beds are single without a partition or bed curtains for more privacy, but on the other hand rooms are spacious, bright, and clean. Hostel is well located just across the street from the beach, and within walking distance from the ferry port, bus station, grocery store, bars and restaurants. Other facilities include shared terrace with deck chairs, BBQ, and kitchen. Find more info here. Hostel Jerko, Supetar: Stylish and modern interior, outdoor swimming pool, shaded terrace, air-conditioned double, triple, twin rooms and suites with private bathrooms (all!) make hostel Jerko feels more like a hotel than your typical hostel. Location is great, right at the heart of Supetar. More info here. We've already mentioned some of our favorite restaurants in Brac, but few of them we'd like to elaborate a bit more. Restaurant Kopacina: Go to place on the island if you like lamb (although almost every good or bad restaurant on the island serves lamb), restaurant Kopacina is popular among locals and tourists alike. Restaurant is located on the way from Supetar to Bol, and many people plan a lunch or dinner stop here as they go to or from ferry. Reservation is recommended. Terrace Cicco: This off-the-beaten path terrace-restaurant (no indoor sitting) has a simple, one-page menu consisting of mainly fish, and seafood dishes, but also few lamb classics, and prosciutto. It closes before dark, as they have no electricity. Great place to spend an afternoon, lazing in the sun at the small pebbly beach beneath restaurant, and enjoying simple, but succulent Cicco's cuisine. Kastil Gospodnetic: Another one among locals' favorite restaurants with fresh local food, homemade wine, and good value for money. Located in a small village of Dol, in a historical building, the restaurant has friendly atmosphere, and lovely views from the terrace. Further reading: We hope that our guide to top things to do on Brac Island helps you better plan your holidays on this wonderful Dalmatian island. You can also check our comprehensive Travel Guide to the Brac Island, or find out what to see and do on the island of Brac in 3 days. If you are still not sure where to visit in Croatia, check our popular post on Top things to do in Croatia. Or check our popular destination guides. Have you ever visited the island of Brac? Do you plan to visit it? Let us know in the comments below. glad you like Barba Danilo. Didi you find any interesting places on Pasman and Hvar? We actually never been lucky with restaurants in Skradin (ate there twice but not very good). So I would love to hear your suggestions on restaurants in Skradin. Thanks, Gordaa! Glad you like it. Do you have anything to add? Did we miss anything interesting? Wow! Did you do all of that in a couple of days? Sounds like I will need a week on Brac? Great article, thanks so much, I am planning a visit to Croatia in September and will definitely book some time in Bol. Thinking of taking a car to the island, do you think we need it? Thanks again Karen. thanks for reading. Yes, if you want to see a bit of an island, it would be good to rent a car. However if you want to save some money, book the car on the island (don’t cross over with the car). Brac is island of culture and adventure, there is so much to do you can’t consume it all on a short holiday. Worth visiting by all means. Thanks for your comment, Gordana! We sure did enjoy our time on the island of Brac. And it would certainly be great to spend more time on the island. A weekend was sweet, but left us wanting to experience more. Hi Karen. If you are planning to visit September 2017 and enjoy walking we would be happy to show you some hidden gems on the Island we live there four months of the year were based in Milna on Brac.